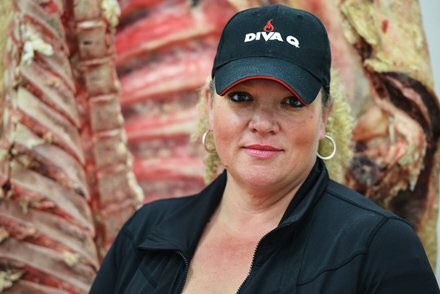 Danielle Bennett, a Canadian woman known worldwide as Diva Q, is the only person ever issued a visa into the United States as a “person of extraordinary talent – barbecue expert.” That’s what she is. A tattoo on her arm says “UNSTOPPABLE” and she is that, too. 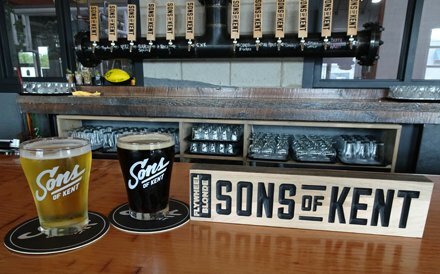 We met Danielle at Sons of Kent Brewing in Chatham, Ontario, just one of the Diva Q’s stops on her Canadian Traeger Shop Class tour. 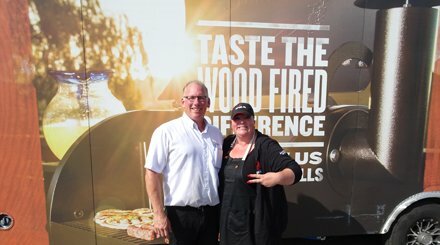 A BBQ champion, Danielle travels the world representing Traeger wood fired grills, teaching the latest and trendiest of barbecue from chocolate-covered candied bacon and mac and cheese to pulled pork and beef brisket. 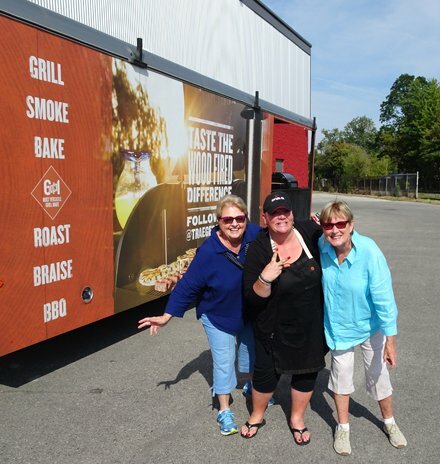 When we arrived she was in her fifth wheel in the craft brewery’s parking lot, in the surprisingly hot September heat, prepping pork, chicken, and beef from Schinkel’s Gourmet Meats in Chatham. We settled inside the pub to talk. The Cooking Ladies sampled Sons of Kent’s Coco-B-Ware, a dark, frothy coconut porter and Blanco Sanchez, a spicy and crisp Belgian Wheat. “I show people that you don’t have to be a man to grill,” Danielle said as she sipped on a coke with one eye on the clock and the other on her Traeger grills out the window. Our sentiments exactly. The Diva Q and The Cooking Ladies are sisters in grilling. 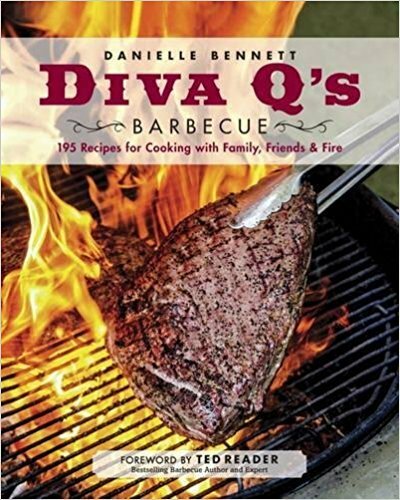 Danielle’s backyard barbecue cookbook came out in 2016. Ours was published this spring. 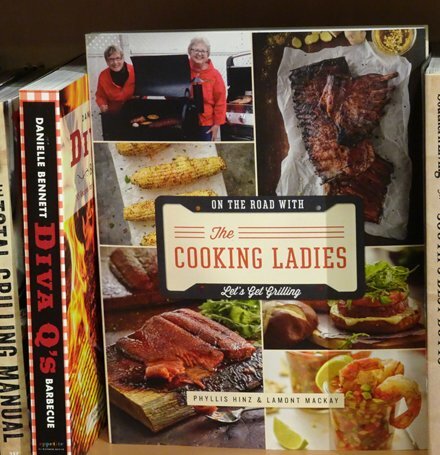 Our grilling book shares a bookshelf with Diva Q’s book, in Chapters. Danielle learned barbecue by rolling up her sleeves and pitching in at large and small, known and unknown BBQ joints all over the US. She washed dishes, carried carcasses, and drove truck. Since those days she has taken thousands of students from being reluctant to step up to the bbq grate to becoming creative wood fired grillers. “I’m still learning, too. It’s okay to learn,” she said. 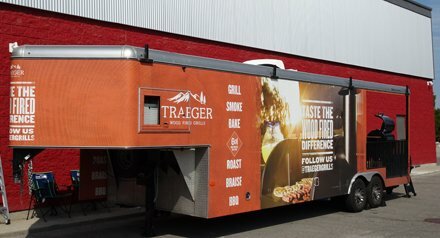 In her Traeger Shop Classes she shares her love for barbecue all the way from the meat preparation to the grill work and tasting. Danielle’s unstoppable career includes three seasons hosting BBQ Crawl, an unscripted show where she traveled to barbecue pits all over the US, interviewed grillers, and competed in intense contests. The Diva Q is serious about barbecue but she also knows how to have fun. As we said goodbye, she tightened her apron, shifted her ball cap, and stepped up to the grills, giving the hot Chatham sun another opportunity to add to her griller’s tan.